Half Human. Half Fiction. All Action and Adventure. Diogenes Ra, Joseph Lamere’s breakout character of 2013, returns in DRAMATIS PERSONAE: CHARACTER FLAWS from Pro Se Productions. In CHARACTER FLAWS, Diogenes Ra is using his unique talents as a half-fictional character, working for an auction house that deals with the disembodied consciousnesses of famous--and infamous--fictions. Up for sale is the consciousness of Praed Pontine, so-called Master of Detection and heir to the memories and inner workings of the Great Detective himself, Sherlock Holmes. Security is tight. Tensions are high. All the most famous thieves of the past half-century are on hand, looking for weak spots in the security. When the auction goes awry and Pontine's consciousness winds up in the hands of a master thief named Baffle, Ra has to travel into fiction's past in order to catch him. This time he has company: the implanted "back seat driver" who calls himself the Narrator, the voice of conscience which has issues of his own. While visiting fiction's past Ra crosses paths with his father, Seamus the Shamus, a trans-temporal collision that has unforeseen consequences for them both. 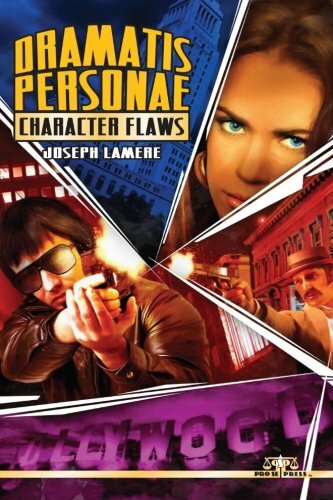 DRAMATIS PERSONAE: CHARACTER FLAWS sees Joseph Lamere’s extremely popular concept return for a second volume. In a world where a man can be both real and fictional, human and character, anything can happen. And usually does to Diogenes Ra. Mystery, drama, action, and humor all come together in the follow up to DRAMATIS PERSONAE: PUBLIC DOMAIN. Featuring a gritty cover by artist Jeff Hayes and logo design and print formatting by Percival Constantine, DRAMATIS PERSONAE: CHARACTER FLAWS is now available at Amazon and at Pro Se’s own store at http://tinyurl.com/mv2xocy for $12.00. The novel will be available in a matter of days as an Ebook on Amazon, Barnes and Noble, and Smashwords. PRO SE PRODUCTIONS TAKES READERS TO 'THE MANY WORLDS OF ULYSSES KING'!